Philip and Stephanie Carr-Gomm have teamed up with artist Will Worthington to create a masterful Tarot deck with Wiccan and Druidic themes. 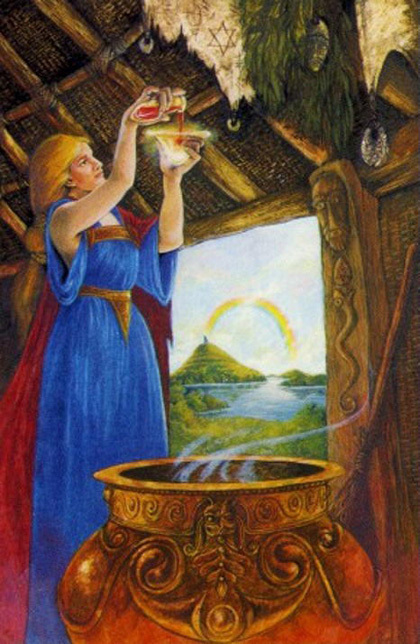 The colorful, sensual images of the Druid Craft Tarot promote the integration of masculine and feminine energies, the strengthening of our connection with the natural world, and the deepening of knowledge of the self and the universe we inhabit. There are some noteworthy changes to the standard Major Arcana: The Emperor becomes The Lord while The Empress becomes The Lady. The Devil is replaced by Cernunnos, the horned god of fertility. His life-force is known as Nwyfre, which Druids seek to integrate and channel in appropriate and responsible ways. Temperance is re-named The Fferyllt, a Druid alchemist who combines the powers of fire and water to create harmony, balance, and transformation. Judgment is re-named Rebirth, and features a child emerging from the Temple-Tomb of New Grange on the morning of the Winter Solstice. Standing outside the entrance, the Priest-Initiator blows into a ritual horn, summoning the re-born initiate soul to awaken.